A geoglyph (an enormous image drawn on the ground surface) at Pisco Bay (Perú) is often regarded as one of the more mysterious archaeological sites of South America. Often called the Candlestick of the Andes because of its resemblance to a three-branched candlestick, it is incised onto a hillside, enabling it to be seen from as far out to sea as 19 km (12 miles). There are conflicting estimates of its size, ranging from 181 m to 244 m (595 feet to 800 feet), although the smaller is the most popular quoted length, and it is often attributed to the Paracas Culture of the first millennium BCE. The image was built by digging trenches up to a metre deep through the hardened sand surface of the hillside. 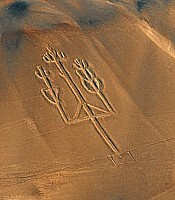 As well as the principal ‘Candelabra’ image, there are other lines etched into the hill. It has also been suggested by Frank Joseph that it resembles jimson (Datura stramomium), a member of the belladonna family sometimes used as an hallucinogenic drug, when smoked or infused in hot water. He suggested that prehistoric inhabitants of the Paracas region travelled north to California to collect the plant (this is the closest area where it grows) and used the geoglyph to help navigate home. This is somewhat far-fetched. Local folklore describes it as a landmark made by early sailors, representing the lightning rod of the god Viracocha; other suggestions about its symbolism include a cactus or the constellation of the Southern Cross. It is still used as a landmark for ships cruising off the peninsula. The ‘Candelabra’ is certainly enigmatic. This is not evidence that it was produced by a technologically accomplished unknown civilisation, though. Instead, it shows how little we currently understand about both the site and about the context of the pre-Colombian cultures that were responsible for its construction. If I had to make a giant geoglyph at an angle, I’d attach some ropes too. Maybe they were just advertising where they got their smokey smoke from lol This way to the hallucinogenics. Hmmm……Don’t think so some how. The above Candelabra of Andes is made by Maya, around 17000 year B.C. as a sign of the direction ‘East’, as a boundary of the Kingdom of Gods and Demons. For detailed information in respect of Candelabra of Andes read the book “A Relastic Approach to Valmiki Ramayana” written by Dr. P. V. Vartak, 521, Shaniwar Peth, Pune, State Maharashtra, India. Made by the Maya? When they lived many hundred of miles to the north? What were they doing in Perú? It must represent some type of wooden structure as the triangle shape would ahve been used to support the arms. A typical structural element so this would not be a plant but the arms could ahve supported some find of plant or torches as for a light house type structure.